As an integral part of the submission process, corresponding authors are required to confirm whether they or their co-authors have any conflicts of interest, and to provide details of these if they exist. It is the corresponding author’s responsibility to ensure that all authors adhere to this policy. Conflict of interest information should be included in a statement in the published article. Sources and grant numbers should be included in the acknowledgements at the end of the paper. Approval by a Research Ethics Committee must be mentioned in the article for all research involving human subjects. The research should be conducted according to the Declaration of Helsinki (2013) guidelines. Articles involving research with animals must conform to the legal requirements of the country in which the work was carried out. A statement identifying institutional committee approval of the experiments must be included in the article. 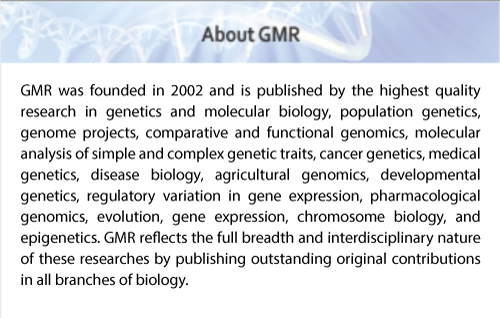 Articles published in Genetics and Molecular Research are open-access, distributed under the terms of the Creative Commons Attribution License, which permits use, distribution, and reproduction in any medium, provided the original work is properly cited and not used for commercial purposes. For details, see Creative Commons Legal Code Attribute-NonCommercial- ShareAlike 4.0 International (CC BY-NC- SA 4.0). In general terms, articles may be reproduced without specific permission from this journal in the following cases: a) single copies for the purposes of private study or research only; b) multiple copies for the use in a non-profit teaching basis.